Wadham is a liberal and progressive college which aims to maintain the diversity of its student body and a friendly atmosphere. Founded as a men's college, in 1974 it was among the first become coeducational, and the college has a strong reputation as a promoter of gay rights. In 2011 it became the first Oxford college to fly the rainbow flag as part of queer week, a celebration of sexual diversity and individuality. Wadham is one of the largest colleges of the University of Oxford, with about 460 undergraduates, 180 graduate students, and 65 fellows. As of 2017, it had an estimated financial endowment of £96 million, and in 2014/2015 ranked 3rd in the Norrington Table, a measure which ranks Oxford colleges by academic performance. The college was founded by Dorothy Wadham (née Petre) in 1610, according to the wishes set out in the will of her husband Nicholas Wadham. Over four years, she gained royal and ecclesiastical support for the new college, negotiated the purchase of a site, appointed the West Country architect William Arnold, drew up the college statutes, and appointed the first warden, fellows, scholars, and cook. Although she never visited Oxford, she kept tight control of her new college and its finances until her death in 1618. The wardenship of John Wilkins (1648–1659) is a significant period in the history of the college. Wilkins was a member of a group which had met for some years in London to discuss problems in the natural sciences. Many of the group moved to Oxford and held regular meetings in the Warden's lodgings at Wadham. Among them were Robert Boyle, Robert Hooke, John Locke, William Petty, John Wallis, and Thomas Willis. Wadham provided the largest contingent, some twelve of the fifty names mentioned. These included Christopher Brookes (mathematician and instrument-maker), John Mayow (a distinguished chemist and physician), Lawrence Rooke (later astronomy professor at Gresham College, London), Thomas Sprat (later the official historian of the Royal Society), Seth Ward (mathematician and Savilian Professor of Astronomy), Sir Christopher Wren (mathematician and Savilian Professor of Astronomy). Sir Christopher Wren was an undergraduate at Wadham before he became a fellow of All Souls and then succeeded Rooke as astronomy professor at Gresham College, London. He eventually returned to occupy rooms at Wadham while he was the Savilian Professor of Astronomy from 1661. Wren had notable achievements in pure and applied mathematics, astronomy, physics and biology to his credit before, in his thirties, turning to architecture. Alone in mathematical ability Wren was ranked by competent authorities second only to Newton among the men of his time. The Warden's lodgings were stuffed with ingenious instruments, and powerful telescopes were mounted on the college tower. The Oxford group kept up close relations with their colleagues in London, and in 1660, at Gresham, the decision was taken to create the body which, in 1662, was to be formally incorporated as the Royal Society. Wilkins was the first president of the provisional body, and became the first secretary of the Royal Society itself. These were the beginnings of organised scientific research in Britain. Maurice Bowra was warden of the college from 1938 until 1970, and was influential in determining the character of the college as open and meritocratic. He was known for his hospitality but also for his waspish wit, and anecdotes about his time as Warden remain in circulation amongst Wadham alumni. A statue of Bowra is in the college gardens, and the college's 1992 Bowra Building bears his name. The college now consists of some 70 Fellows, about 230 graduate students, and about 450 undergraduates. The current Warden is Lord Macdonald of River Glaven QC, former Director of Public Prosecutions. Lord Macdonald succeeded Sir Neil Chalmers as Warden upon his retirement in 2012. In 1974, after more than three and a half centuries as a men-only institution, Wadham was among the first group of five all-male colleges at Oxford to admit women as full members, the others being Brasenose, Jesus College, Hertford and St Catherine's. Wadham College has a reputation as a supporter of gay rights partly because it plays host to "Queerfest", a celebration of the LGBTQ cause. In 2011, Wadham became the first Oxbridge college to fly the Rainbow Flag in support of equality, as part of its annual Queerweek. The Rainbow Flag also flies over Wadham each year during February, to mark LGBT Month. A Wadham student tradition is that student social events are always concluded with the playing of Free Nelson Mandela. The motion to play the song to conclude every student event until Nelson Mandela was freed from prison was passed by the Wadham Student Union in 1987, when Wadham alumnus Simon Milner (History, 1985), now Policy Director at Facebook, was SU President. Following Mr Mandela's liberation, the Student Union voted to continue the tradition as a mark of affection. President Mandela visited Wadham College and dined there on 11 July 1997. In 2017, this tradition was challenged by a South African student, who is a member of the ANC and active in equality campaigning in South Africa, as no longer appropriate given the complex legacy of Mandela in post-Apartheid South Africa. He also highlighted that there is much more to South Africa than just the history of Apartheid, and that constant reference to it rather than South Africa's current issues is outdated and to the progressive act it was intended to be. A vote to remove the constitutional requirement to play the song was narrowly defeated in a Wadham SU meeting. In 2013 the current warden, Lord Macdonald of River Glaven QC, created the Wadham Human Rights Forum, a new public forum for the discussion of human rights issues that welcomes top level speakers to Wadham College. Lord Macdonald is also frequently in the media speaking on legal issues and, particularly, on issues relating to rights and security. Wadham is sometimes put forward as the last major English public building to be created according to the mediaeval tradition of the master mason. Wadham's front quadrangle (quad), which served as almost the entire college until the mid-20th century, is also an early example of the "Jacobean Gothic" style that was adopted for many of the University's buildings. The main building was erected in a single building operation in 1610–13. The architect, William Arnold, was also responsible for Montacute House and Dunster Castle in Somerset, and was involved in the building of Cranborne Manor, Dorset for Robert Cecil, 1st Earl of Salisbury, James I’s Lord Treasurer. The style of the building is a fairly traditional Oxford Gothic, modified by classical decorative detail, most notably the 'frontispiece' framing statues of James I and the Founders immediately facing visitors as they enter the college. Classical, too, is the over-powering emphasis on symmetry. The central quadrangle was originally gravelled throughout; the present lawn was laid down in 1809. The college was refaced in the 1960s, and much of the front quad has undergone further restoration work. In 1898, the hall was the third largest amongst Oxford colleges after Christ Church and New College. It is notable for its great hammer-beam roof and for the Jacobean woodwork of the entrance screen. The portraits include those of the founders and of distinguished members of the college. The large portrait in the gallery is of Lord Lovelace, who held Oxford for William of Orange during the Revolution of 1688; the inscription records his role in freeing England 'from popery and slavery'. Although a ceremonial door opens directly into Front Quad, the chapel is usually reached through the door in staircase 3. The screen, similar to that in the hall, was carved by John Bolton. Originally Jacobean woodwork ran right round the chapel. The present stone reredos was inserted in the east end in 1834. The monumental East window depicting Jonah's whale, top right, was made by a Dutchman, Bernard van Linge, in 1622. The elegant young man reclining on his monument is Sir John Portman, baronet, who died in 1624 as a nineteen-year-old undergraduate. Another monument is in the form of a pile of books; it commemorates Thomas Harris, one of the fellows of the college appointed at the foundation. The Chapel organ dates from 1862. It is one of the few instruments by Henry Willis, the doyen of Victorian English organ builders, to survive without substantial modification of its tonal design. It is thought that the chapel was the first religious building in England to regain its stained glass and statuary following the reformation. Limited additions were made during the 18th and 19th centuries, including a converted warehouse originally used to store bibles. A series of expansions since 1952 have made use of a range of 17th- and 18th-century houses and several modern buildings to create a Back Quad between the Front Quad and Holywell Street. The small quadrangle formed by the Junior Common Room, the 1950s accommodation block, the Holywell Music Room and (latterly) the Bowra Building was sometimes known to students as the "Ho Chi Minh" quad. It is thought to have been thus named (in honour of Vietnamese revolutionary leader Ho Chi Minh) during the period of student radicalism in the 1960s. The quad is used for games of croquet. The college grounds contain the Holywell Music Room. This is said to be the oldest, purpose built music room in Europe, and hence England's first concert hall. It was designed by Thomas Camplin, at that time Vice-Principal of St Edmund Hall, and opened in July 1748. The interior has been restored to a near-replica of the original and contains the only surviving Donaldson organ, built in 1790 by John Donaldson of Newcastle and installed in 1985 after being restored. The Ferdowsi Library (formerly the Ashraf Pahlavi Library) specialises in Persian literature, art, history, and culture. It possesses about 3,500 volumes, almost 800 manuscripts, about 200 lithographs in Arabic and Persian, and about 700 rare and early Armenian books, most of which were donated by Dr. Caro Minasian. At the end of the 1960s, the Warden, Maurice Bowra, President of the British Academy and one of the first co-founders of the British Institute of Persian Studies (BIPS), welcomed a donation to construct the building of the New Library in Wadham, where the emphasis would be given to Persian Studies and the post in Persian. Since then a special connection between Wadham and Iran has been established. The Wadham library building was initially funded by donations from the then (1976) Iranian ruling family, the Pahlavi dynasty. The funds were secured by Fellow and tutor in economics, Eprime Eshag. The building, with associated accommodation blocks, was designed by Gillespie, Kidd & Coia. Today the library is open 24/7 and has wireless connectivity throughout. The Bowra Building next to the Ferdowsi Library and Bar Quad was designed by Sir Richard MacCormac and opened in 1992. It includes a cafeteria, bar, seminar rooms, squash court and the Moser Theatre as well as student rooms. The McCall MacBain Graduate Centre was designed by Lee/Fitzgerald Architects and opened in 2012. It provides a dedicated social and study space for Wadham’s graduate students on the main site of Wadham college. The Merifield annexe is in Summertown, about 1.2 miles from the centre of town. Most of the graduate student accommodation is at Merifield. 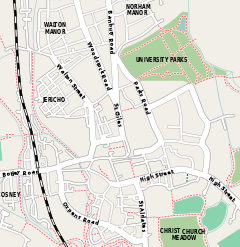 Wadham Gardens are relatively large when compared with those of other Oxford colleges, even without the land sold to build Rhodes House in the 1920s. Originally a series of orchards and market-gardens carved out from the property of the previously existing Augustinian priory, their appearance and configuration have been significantly modified over the course of the last four hundred years to reflect their constantly changing functional and aesthetic purpose. The land was shaped, in particular, by two major periods of planning. Gardens were first created under Warden Wilkins (1648–59) as a series of formal rectangles laid out around a (then fashionable) mound which was, in turn, surmounted by a figure of Atlas. These gardens were notable not least for their collection of mechanical contrivances (including a talking statue and a rainbow-maker), a number of obelisks and a Doric temple. Under Warden Wills (1783–1806), the terrain was then radically remodelled and landscaped (by Shipley) and became notable for a distinguished collection of trees. Restored and reshaped following the Second World War, the present Gardens are divided into the Warden's Garden, the Fellows’ Private Garden and the Fellows’ Garden, together with the Cloister Garden (originally the cemetery) and the White Scented Garden. They are still notable for their collection of trees (specimens include a holm oak, silver pendent lime, tulip tree, golden yew, purple beech, cedar of Lebanon, ginkgo, giant redwood, tree of heaven, incense cedar, Corsican pine, magnolia and a rare Chinese gutta-percha) and they still contain a number of vestigial curiosities from the past (notably an 18th-century 'cowshed' set into the remnants of the Royalist earthworks of 1642, one of the second generation of 'Emperors Heads' that adorned the Sheldonian Theatre from 1868 to around 1970, and a sculpture of Warden Bowra). Undergraduate students at Wadham are guaranteed accommodation within college for the first and final years of their course. In the second (or fourth) year they have the opportunity to live in the Merifield annexe. Since 1976, Wadham has been distinctive in having a Student Union, which in principle represents both undergraduate and graduate members. In practice the SU is more concerned with undergraduate interests and activities, whilst the separate MCR committee represents graduate students. All students can use the on-site facilities such as the Moser Theatre, squash court, gym, kitchen, laundry room, music practice rooms and various meeting rooms. The JCR Lounge is the main common room space used by undergraduate students, along with the bar. Since 2012 the MCR has had its own social area in the McCall MacBain Graduate Centre, with its kitchen, small bar, and Media room. The college sports ground is located in Summertown, adjoining the Merifield residential complex. Wadham has a student exchange program with the Sarah Lawrence College in New York. About 30 students come each year and live at Merifield, and about six Wadham students go to SLC in the spring each year for 3 weeks. There are elected welfare officers on both the SU and MCR committees. There is a general welfare room, as well as a men's room and women's room. The college also has a nurse who runs an open surgery. Wadham has a relatively high number of state school students, compared to other Oxford colleges. Wadham hosts Queer Festival (formally Queer Bop), and Wadstock (a twelve-hour live music festival). It also hosts bops five times a term in Michaelmas term and Hilary term. A Wadham student tradition is that events are always concluded with the playing of Free Nelson Mandela. There are three football teams, men and women's boat crews, a hockey team with Corpus (Warpus), trampolining Cuppers side (mixed); Gaelic Football Cuppers side, men's darts, men's rugby, women's rugby Fives, as well as Ultimate Frisbee. Wadham College Boat Club is the rowing club for students at Wadham, and due to an affiliation it also allows Harris Manchester College students to join. The college boat house is located on Boathouse Island. Wadham had amongst its fellowship the notable poet John Wilmot, 2nd Earl of Rochester (1647–1680) who earned a reputation as the most famous womanizer of his era. The 2004 movie The Libertine, which starred Johnny Depp as Rochester, coincidentally also starred Rosamund Pike, a Wadham alumna. But be a fine Fellow at bottom. The college was renowned for its relaxed attitude to homosexuality, and revelled in its nickname of 'Sodom'. Dear Gentlemen: We note your threat to take what you call 'direct action' unless your demands are immediately met. We feel it is only sporting to remind you that our governing body includes three experts in chemical warfare, two ex-commandos skilled with dynamite and torturing prisoners, four qualified marksmen in both small arms and rifles, two ex-artillerymen, one holder of the Victoria Cross, four karate experts and a chaplain. The governing body has authorized me to tell you that we look forward with confidence to what you call a 'confrontation,' and I may say, with anticipation. The letter seemed to have dimmed the students' fire, was reprinted in Harper's Bazaar, and cited in newspaper columns and speeches for at least two years following its publication. In the days when Oxford colleges locked their gates overnight, Wadham was regarded as a particularly difficult college to climb into after the gates closed. One route into the college was said to be via the Warden's Lodgings in the corner of the front quad. College legend has it that an undergraduate was quietly making his way through the lodgings when Warden Bowra entered the room. The undergraduate rapidly secreted himself behind a sofa, whilst Bowra took a book from the bookcase and settled down to read for several hours. When Bowra eventually rose to leave, he quipped "turn the lights off before you go, there's a good fellow". The pattern in the pavement outside the student bar at Wadham College is a Penrose tiling, named after the Wadham mathematician Roger Penrose who invented it in the 1970s. Penrose tilings have many interesting mathematical properties, and they also explain the structure of some unusual metallic crystals, called quasicrystals, that were discovered in the 1980s and won Dan Shechtman the Nobel Prize for Chemistry in 2011. In January 2013, skeletons were discovered during building works on college grounds. Contrary to previous rumours of bullet wounds being found on one of the bodies, these remains were found to be medieval in origin. In common with many Oxford colleges, Wadham has produced a wide range of graduates in the fields of economics, history, law, physiology, medicine, management, humanities, mathematics, science, technology, media, philosophy, poetry, politics and religion who have contributed significantly to public life. Notable members of the college in its early years include Robert Blake, Cromwell's admiral and founder of British sea-power in the Mediterranean, the libertine poet and courtier John Wilmot, 2nd Earl of Rochester and Sir Christopher Wren. Wren attended the meetings of scientifically inclined scholars which were held by Warden John Wilkins (Cromwell's brother-in-law) in the college in the 1650s. Those attending formed the nucleus of the Royal Society at its foundation in 1662. John Wilkins invited Robert Boyle to Oxford in 1653, writing that "[I] shall be most ready to provide the best accommodations for you, that this place will afford". Boyle moved to Oxford in 1655, but preferred not to accept Wilkins's offer of accommodation, choosing instead to arrange his own rooms where he could carry out his scientific experiments. Boyle became a member of the Oxford Philosophical Club that met weekly in Wilkins's chambers at Wadham, as did Robert Hooke who became Boyle's assistant after having been a chorister at Christ Church. Arthur Onslow (1708), a great Speaker of the House of Commons, and Richard Bethell, who became Lord Chancellor as Lord Westbury in 1861, were members of the college. Two 20th century Lord Chancellors, F. E. Smith (Lord Birkenhead) and John Simon, were undergraduates together in the 1890s, along with the sportsman C. B. Fry; Sir Thomas Beecham was an undergraduate in 1897, though soon abandoning Oxford for his musical career. Frederick Lindemann, 1st Viscount Cherwell, who was Churchill's scientific adviser during the Second World War, was a fellow of the college. Cecil Day-Lewis, later Poet-Laureate, came up in 1923, and Michael Foot, later leader of the Labour Party, in 1931. Sir Maurice Bowra, scholar and wit, was Warden between 1938 and 1970. Robert Moses, the city planner, rose to the college in 1911. Among recent members have been Dr Rowan Williams, the former Archbishop of Canterbury, Lord Dyson, former Justice of the Supreme Court of the United Kingdom and Master of the Rolls, author and broadcaster Melvyn Bragg, writer and journalist Jonathan Freedland, novelists Hari Kunzru and Monica Ali, and the mathematical physicist and philosopher Sir Roger Penrose (who was Rouse Ball Professor of Mathematics 1973–1999, and is now an emeritus fellow). Wasim Sajjad, a senior lawyer in Pakistan, who served as the Chairman of the Senate of Pakistan and also as the President of Pakistan for two non-consecutive terms, studied in the college on a Rhodes scholarship and was also elected as an Honorary Fellow of the college in 1966. Andrew Hodges, the theoretical physicist and author of The Imitation Game, the biography of Alan Turing, is a Tutorial Fellow in mathematics at Wadham. Having taught at Wadham since 1986, Hodges was elected a Fellow in 2007, and was appointed Dean from start of the 2011/12 academic year. ^ (engraver. ), Thomas Robson (1 January 1830). "The British herald, or Cabinet of armorial bearings of the nobility & gentry of Great Britain & Ireland" – via Google Books. ^ "Undergraduate numbers by college 2015-16". University of Oxford. ^ "Warden's Welcome". Wadham.ox.ac.uk. Retrieved on 2013-09-23. ^ a b "Women at Oxford". University of Oxford. Retrieved 12 June 2016. ^ "Oxford college flies university's "first-ever rainbow flag"". ^ "Undergraduate Degree Classifications - University of Oxford". ^ a b "History of Wadham". www.wadham.ox.ac.uk. Retrieved 11 September 2009. ^ Davies, C.S.L. (September 2003). "A Woman in the Public Sphere; Dorothy Wadham and the Foundation of Wadham College, Oxford". The English Historical Review. 118 (478): 883–911. doi:10.1093/ehr/118.478.883. JSTOR 3491127. ^ a b c C. Davis and J. Garnett (2008). Tutorial Teaching at Wadham: A History. Oxford: The Development Office of Wadham College. ^ a b Wells, Joseph (1898). Wadham College. London: F. E. Robinson. ^ Wadham, College News. "Queerfest 2016". www.wadham.ox.ac.uk. Retrieved 19 August 2017. ^ a b "Wadham students pay tribute to Nelson Mandela". wadham.ox.ac.uk. Retrieved on 2013-12-23. ^ Students pay tribute to Nelson Mandela. Wadham.ox.ac.uk. Retrieved on 2014-04-12. ^ "Human Rights Forum at Wadham College". wadham.ox.ac.uk. Retrieved on 2013-12-23. ^ Tyack, Geoffrey (1998). Oxford: An architectural guide. Oxford University Press. pp. 187–188. ISBN 0-14-071045-0. ^ a b c "Wadham receives early birthday present". University of Oxford. 19 May 2009. Archived from the original on 2 December 2012. ^ HIM and his Friends | Foot. Socialist Register. Retrieved on 2013-09-23. ^ "The Wadham Library". wadham.ox.ac.uk. Retrieved on 2013-12-20. ^ "Bowra Building". wadham.ox.ac.uk. Retrieved on 2018-08-07. ^ "McCall MacBain Graduate Centre". wadham.ox.ac.uk. Retrieved on 2018-08-07. ^ a b "Undergraduate student accommodation in Wadham". wadham.ox.ac.uk. Retrieved on 2013-12-23. ^ "Graduate student accommodation in Wadham". wadham.ox.ac.uk. Retrieved on 2013-12-23. ^ "Students' Union, Wadham College". su.wadham.ox.ac.uk. Retrieved on 2013-12-23. ^ "MCR, Wadham College". mcr.wadham.ox.ac.uk. Retrieved on 2013-12-23. ^ "Sarah Lawrence College in Oxford". slc.edu. Retrieved on 2013-12-23. ^ "The Sarah Lawrence Programme". wadham.ox.ac.uk. Retrieved on 2013-12-23. ^ a b c . thestudentroom.co.uk. Retrieved on 2013-12-20. ^ Virginia Brackett (2008). The Facts on File Companion to British Poetry: 17th and 18th Centuries. ISBN 0816063281. See p. 351. ^ Larman, Alexander (2014). "Rochester's Oxford" (PDF). Oxford Today. 27 (1): 31–34. .
^ Dormandy, Thomas (2006). Online excerpt from Thomas Dormandy's The Worst of Two Evils: The Fight Against Pain. ISBN 9780300113228. ^ Larman, Alexander (2014). "Rochester's Oxford" (PDF). Oxford Today. 27 (1): 31–34. See p. 34. ^ O'Neill, William (1971). Coming Apart. Quadrangle Books. pp. 291–2. ISBN 0-8129-6223-0. ^ Ryan, Michael (2 September 1969). "We'll See You Later, Agitator". The Age (Melbourne). Retrieved 16 June 2013. ^ Roche, John P. (29 September 1969). "Free Speech on the Campus". The Bryan (Ohio) Times. Retrieved 16 June 2013. ^ MacDonald, H. Ian (1970). Higher Education in Ontario: Who Goes? Who Benefits? Who Pays? (prefatory remarks) from The Empire Club Addresses. Toronto: The Empire Club of Canada. pp. 344–358. ^ "Penrose tilings at Wadham College". mathsinthecity.com. Retrieved on 2013-12-23. ^ Tomlin, Jonathan. "Wadham bodies thought to be medieval". Oxford Student. ^ Milmo, Cahal (23 January 2013). "Call for Morse: Skeleton found in Oxford college". The Independent. London, England: The Independent. Retrieved 28 January 2013. ^ Sargent, Rose-Mary (1995). The Diffident Naturalist: Robert Boyle and the Philosophy of Experiment. University of Chicago Press. p. 63. ^ "Biography of Robert Boyle". history.mcs.st-and.ac.uk. Retrieved on 2013-12-22.